Pie is my life, it’s better than cake. Pie is something I understand. It’s layered, it has depth, and doesn’t need to be sweet.….. As I make a sweet cream pie. I like to find uncommon or forgotten desserts. Nothing is wrong with pumpkin or the classic fruit pies. Why stick to the same though? I was watching the series Chef’s Table, one of the chefs is Grant Achatz. He is the executive chef at Alinea in Chicago. He changes his menus often because he is looking for a challenge and something new to him. That was like the slap to the face that woke me up in a way. Sure, the status quo is good, but why? Why are we just doing the same dishes year, after year, after year. Don’t they say to learn from history? Don’t repeat it. This pie was popular during the early to mid 1900’s. Making this brings memories to my parents and grandparents. It also gives everyone a break from the norm. This pie is best a day old. The result is a velvety creamy texture, finished off with notes of cinnamon and Nutmeg. Combine sugar, flour, and salt until blended. Add the 2 cups of whipping cream and mix well. Combine the half and half, egg yolks, and vanilla together. Dot the butter around evenly on top of the pie. 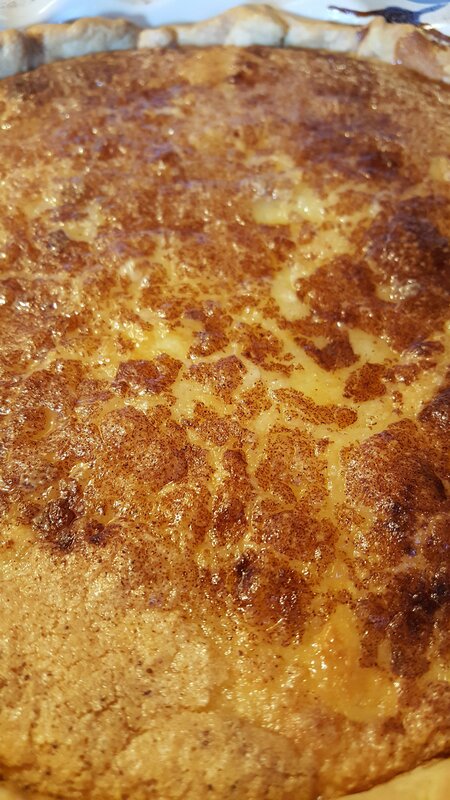 Sprinkle the top of the pie with cinnamon and nutmeg. Bake at 350 until it bubbles through for 10 minutes – about an hour. Check the pie by wiggling the edge of the pie plate, if the pie is still loose in the center, it isn’t done. When it no longer loosely and sloppily jiggles, it is done. It will still be a little jiggly though. Previous Post Pumpkin Waffles from a box! I love love love sugar cream pie. It reminds me of flan, which you will find in French bakeries. Sugar cream is closer, and will be snagged for travel to the fam’s Xmas dinner this year! Its soo good! I Really want to make it, or find somewhere locally that offers it! Check your local grocery case. This time of year especially it should be available. Happy hunting!